Woz: Apple wasn’t built to sell $17,000 watches. 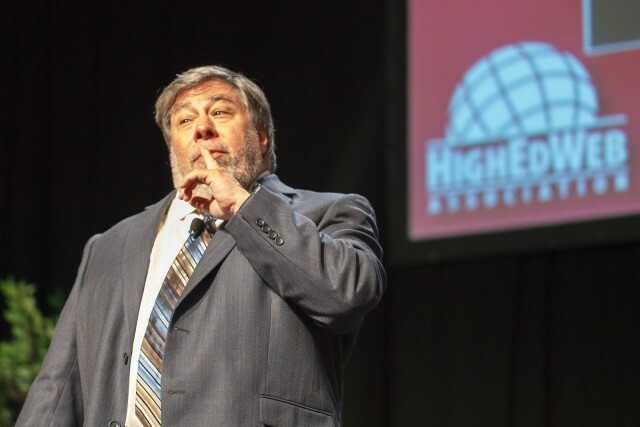 Steve Wozniak seems to have a complex relationship with both modern-day Apple and, particularly, the Apple Watch. In an interview at the Automate/Promat Show in Chicago yesterday, Apple’s co-founder said Apple’s foray into high-end wearables marks a very different turn for the company he helped to found. Woz’s beef, if you can call it that, is with the ultra-expensive Apple Watch Edition. Art may be the right word to use for the gorgeous wearable device, but to Woz at least, it’s not art worth paying a premium for. “I’m going to buy the Apple Watch,” he told the assembled audience, only to add that he would only shell out for “the cheapest one.” Woz’s point was one we’re likely to hear a lot from the tech crowd over the next few months. The lack of different specs between the $349 entry-level Apple Watch and its gold-plated $10,000 counterpart means there’s no point in spending more money. It’s a valid criticism to make, although to try and make sense of the price banding from an engineering perspective (which is how Woz approaches it) is missing the point. As crazy as it sounds to many of us, part of the appeal of the expensive Apple Watch Edition is its ultra-expensive price tag, despite the fact that on paper it does nothing different from the $349 Apple Watch. It’s even possible, as my colleague Leander Kahney eloquently did, to argue that the $17,000 watch might be too cheap. Wozniak went on to note that we’ve “seen a lot of really good things” from Apple since Steve Jobs died, particularly related to larger-screened iPhones, charitable donations and a commitment to employee diversity. However, “that’s not to say everything I’d say about Tim Cook is positive,” he said. This entry was posted in Apple news and tagged Apple Watch, Steve Wozniak. Bookmark the permalink. Here’s what Super Mario 64 looks like running on an iPhone 6.